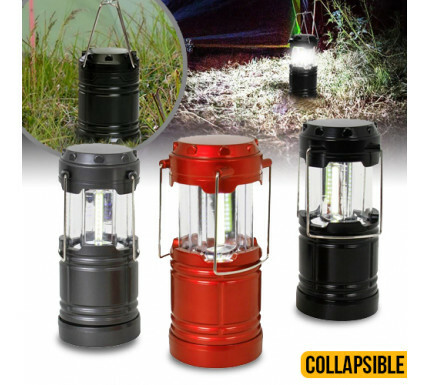 This pop-up lantern is perfect for use at home, on the road or at the campsite. Designed with three extra-bright white COB strips that provide 400 lumens of light, the lantern lights up automatically when opened and turns off when collapsed. Complete in a pack of three lanterns in silver, black, and red. The handles fold down for convenient storage and can be used to hang the lantern for easy hands free use, along with a magnetic base which also allows easy hands free usage in tight spaces. Great for using around the home, travel, camping, hiking, home and car repairs, emergencies, black outs and more! With 360 degree surround lighting, it is sure to brighten any space.